Are you curious what happens after a prospective student submits her contact information on a lead form? You may know that several AIU teams spring into action simultaneously to provide the valuable information and guidance she needs to make a meaningful decision about her education. The first 30 days following a request for information are critical to serving prospective students well. Without proper coordination and collaboration, the students experience can become complex, confusing, and burdensome. Apart from direct conversations, one of the most effective ways to deliver information is by email, where she can access and reference information when its convenient for her. To support this nurturing phase, AIU began developing more targeted email messages in 2016. We want you to see what the prospective student seesso we can be more effective together. This interactive journey is intended to show you firsthand the prospective student’s experience of AIU’s targeted messaging. 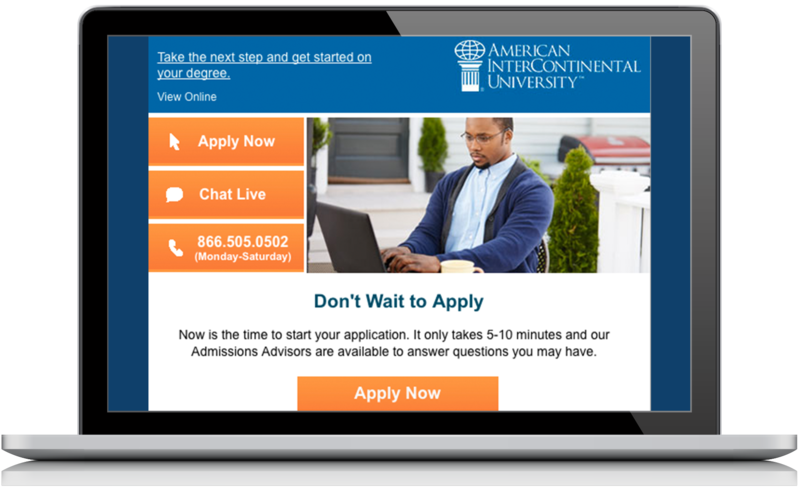 This experience illustrates the email messaging, text messages, and phone calls a prospective student receives. Start your journey below. Along the way, you can learn more facts and figures about the nurture program by hovering over. Prospective students will receive one of two email tracks. Prospective students from these non-CPL lead channels typically enroll at the highest rates, as they are often more familiar with the institution and show higher levels of engagement. Prospective students from these “CPL” or affiliate lead channels typically enroll at lower rates, as they are less familiar with the institution and are likely receiving messages from other schools and the affiliate.